Line S - 42nd Street Shuttle (line letter S is used by all shuttle lines) in New York's subway (former IRT), for the class R-62 subway train. This is a shuttle line on Manhattan with only 2 stations: Grand Central Shuttle Terminal and Times Square. A few trackside and station details in the simulation, announcement of station and connections. There are 2 alternatives for this line: One eastbound and one westbound. In the westbound alternative there is, beyond a clear signal, an 8 cars ghost train occupying the track at the 42nd Street station. 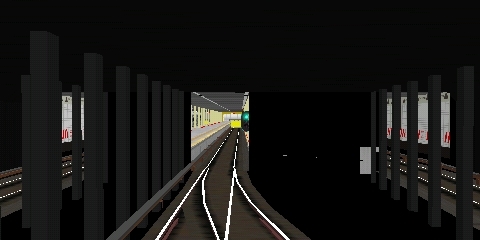 In the eastbound alternative there are pillars and a signal right in front of the train's cab. The route definition code needs some overhaul to get this route, originally made for BVE2, to work properly with OpenBVE.